Gnocchi is one of those recipes that mystifies me when I find out that someone thinks that it’s difficult to make, because not only is it really easy (and cheap) to produce, it’s also easy to produce a lot of it; and that’s exactly what we do. It’s common for me to whip out about four batches at a time of this recipe (a standard mixer should be able to hold two at once) then freeze the lot on a sheet tray and store these little guys in a large plastic bag. It’s such a satisfying meal for us, and the knowledge that we can put in minimal effort for it makes it all the more alluring after a long day of work where you just want something delicious and quick. Just pick your sauce, pop these kids out of the freezer and boil ’em in water till they float, and you’re set. Side note: yes, the gnocchi in this recipe are pressed onto a gnocchi board. Do you need to do that? No, no you don’t. Do grooves hold more sauce? Yeah, they do. Will your dinner be any less delicious if your gnocs are just little grooveless potato lumps that you cut off from your giant slab of dough? Nope, it’ll be awesome. Did we press these onto a groove board just for this post so our gnocchi will look awesome even though we almost never do it in real life? Mix the mashed potato, egg, olive oil, and salt until thoroughly combined. Add the flour all at once and mix (your hands are the best tool for this if you don’t have a mixer) until all the flour is integrated. Continue to knead the dough until it becomes firmer and pulls away from the sides of the bowl. The dough should be smooth and not sticky to the touch, not unlike bread dough but less springy. 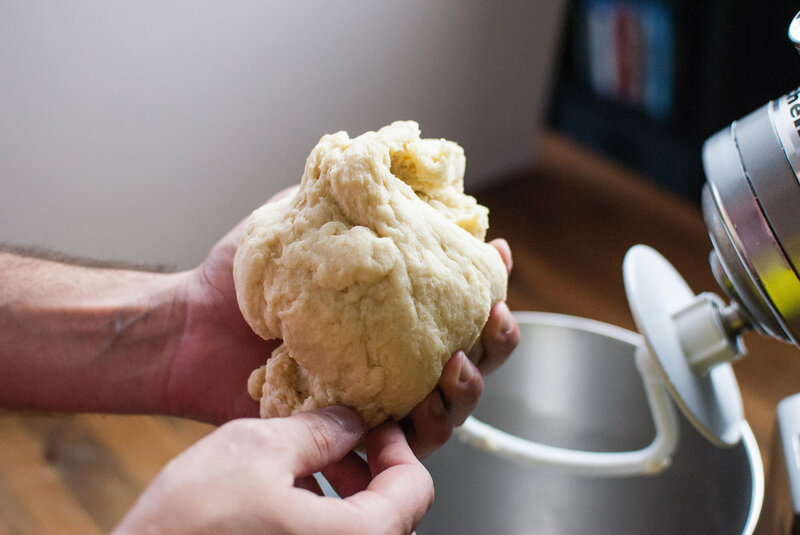 If you’re using a mixer, you’ll need to use the paddle at first to blend the flour into the wet ingredients, then switch to the dough hook once the it all begins to come together. Knead it for a minute or two until it becomes a tight dough. 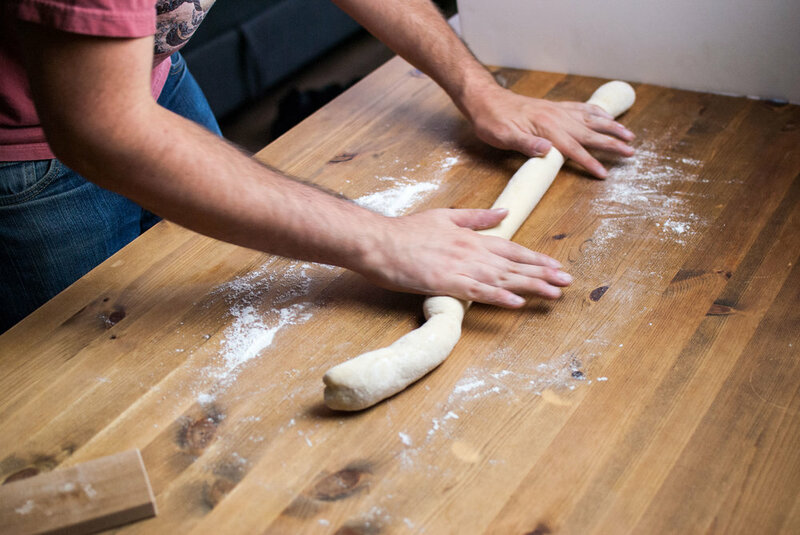 Transfer the dough to a lightly floured table or counter and begin to roll it into a long snake-like shape; it should be a little less than an inch in circumference when you’re finished. The dough will be quite tough and glutinous, so I’ve found that letting gravity stretch it a bit by pulling it and letting it hang in the air (as well as giving a few good thwacks on the table) works quite well to elongate it. Once you’ve got it rolled, take a knife or dough cutter and cut the dough into little nubs. The ideal size of a single gnocch for us is about the size of your thumb pad, so when you’re done, your table might look like it’s covered in a bunch of little floury thumbs (not to be grotesque, but hey, it’s an image you won’t forget). Optional: After cutting the dough, you’re welcome to press your little gnocs onto a gnocchi board to get their groove on. Simply take a gnocch and press it with your thumb onto a floured board, almost like a thumb print cookie, then remove it and fold it into itself so it returns it’s round shape once again with the grooves facing outward (duh). I’ll admit, it’s a bit of a tedious process, but they do look lovely when they’re finished and they really do hold more sauce. I’d recommend this method if you’re tossing them in a tomato sauce. Yields about 65-70 gnocchi, roughly 4 servings.